One thing I love when the weather is cool, is a warm, slightly wilted salad. Sometimes I’ll top a crisp greens with hot ingredients, other times I enjoy wilted greens. 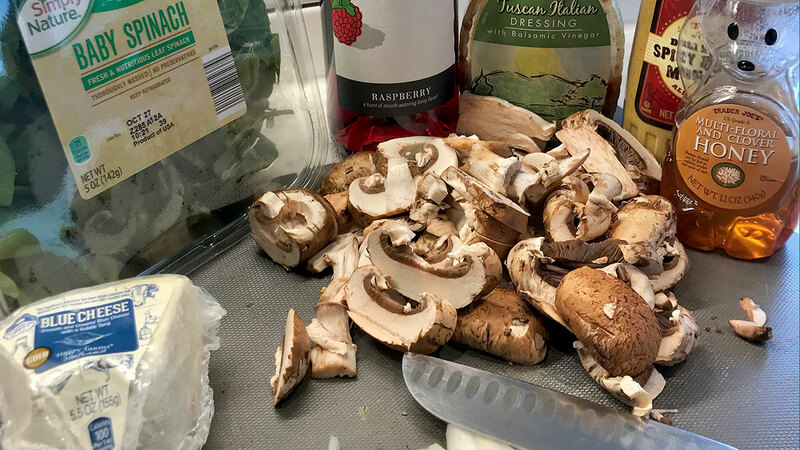 This recipe combines the best of both, including a raspberry wine vinaigrette made with Carlos Creek Winery‘s Raspberry wine that also pairs perfectly with the salad. Enjoy! In a bowl, combine 1/3 cup balsamic vinaigrette salad dressing with 1/4 cup Raspberry wine, 1 tsp honey, 1 tbsp spicy brown mustard, and salt & pepper to taste. Stir well. Heat 1 tbsp oil in a skillet over medium heat. Add minced onions and cook until just transparent. Add mushrooms, 2 tbsp dressing as prepared above, and salt & pepper to taste. Cook until mushrooms are just soft, about 6 minutes. 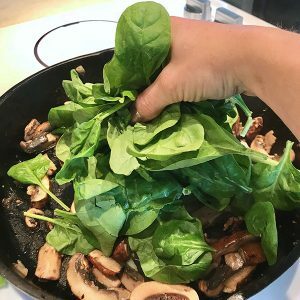 Turn off heat, and add spinach, tossing gently for approximately two minutes until just wilted. Transfer the spinach & mushroom mixture to serving dishes, sprinkle with blue cheese and remaining salad dressing. Serve with remaining wine! Unlike many fruit wines, Carlos Creek’s Raspberry wine is more tart than sweet, with medium-plus acidity. The crispness of the wine plays well alongside a salad with tangy mustard vinaigrette. To tame the tart flavors and acidity: blue cheese and the savory portabella mushrooms. 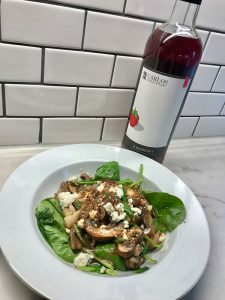 The wine featured in this post was provided as a sample by the producer, all opinions including the pairing suggestion were my own.